An earlier variant of the Babur cruise missile’s launch vehicle. Via Wikimedia Commons. The Babur cruise missile is one of the more dangerous additions to Pakistan’s growing missile arsenal. 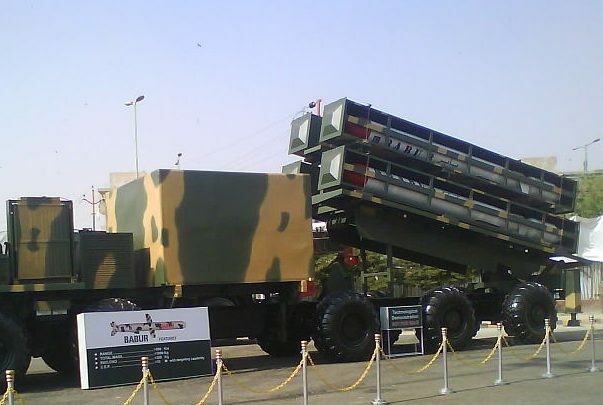 Also known as the “Hatf 7,” the Babur has been tailored into ground and sea launched variants as a deterrent to India’s overwhelming conventional military strength. Very few details about it are available in the public domain but it’s reportedly armed with a 450 kilogram warhead. The ISPR considers the Babur “an important force equalizer for Pakistan’s strategic deterrence.” This suggests its main use in a future conflict is for defending the country’s limited coastline and the vulnerable land border with India. A video clip of the April 14 test released by the ISPR showing a single launcher firing a missile that soared skyward until it traced an arc and disappeared. The ground launched Baburs are carried in trios by a trailer attached to a 10×10 truck–the same vehicles that were spotted in a recent parade. The Babur’s mysterious origins can be traced to the turn of the century. Despite having a vast state-owned military-industrial sector, Pakistan didn’t start producing large rockets and missiles until the 1990s. It still can’t be ascertained how cruise missile technology was shared with the National Engineering and Scientific Commission (NESCOM), which oversees the military’s localized R&D. Most analysis of the Babur suggest it’s similar to the BGM 109A Tomahawk but there’s no evidence proving the US ever allowed a technology transfer for its most valuable cruise missile. Over the years a consensus has emerged that a malfunctioning Tomahawk launched during a punitive air campaign against Al Qaeda in 1998 was retrieved by Pakistan. Apparently, the remains of the missile were found in Balochistan and what happened next inspired much speculation–the first Babur cruise missile was tested several years later. But detailed analysis of the ground launched Babur suggests its design was borrowed from other subsonic cruise missiles from the late Cold War era. Its guidance system, fuel tank, engine, and booster may have been supplied by either China or Ukraine, meaning its resemblance to the Tomahawk is superficial at best. Like many indigenous weapon programs from Pakistan, the Babur’s development has been stop and go for the past 10 years. It was only in 2018 when the program appears to have diversified with serious gains. In January the naval “Harbah” variant was tested on a missile boat. Then in March an underwater platform was used to test launch the Babur 3 that had a range of 450 km. There haven’t been any tests involving air launched Baburs yet. The reason why could be the Pakistan air force’s preference for the Ra’ad cruise missile. There are no official figures revealing how many Baburs have been amassed by Pakistan’s military, who are certainly aware their nemesis India possesses a similar weapon, the Nirbhay cruise missile.